On Jan. 29th 2011, Mark was inducted into the Connecticut Soccer Hall of Fame along with Steve Waters. Born in Hartford, while moving to Wethersfield at an early age, Coach Bob Burford of Silas Deane Jr. HS started Mark on his soccer career. At Wethersfield High School under the leadership of Coach Robert Landers, Mark was a varsity member throughout his high school years. During his Jr. year WHS reached the State Finals. While in his senior year, Mark was tri-captain and earned first team CCIL Honors. At Eastern Ct. State University, Mark played for Coach Tom Nevers. As a starting back at Eastern, during his freshman year, the team was Conference, New England Champions and traveled to the National Championship Finals Tournament placing 3rd in the nation. The next year, Eastern repeated the accomplishments again reaching the National Finals Tournament. During Mark’s junior year, Eastern reached the New England Championship Finals. A knee injury ended his soccer career at Eastern. After Graduation, Mark returned to Wethersfield and started 40+ years working with the soccer community of Wethersfield and Ct. As the Wethersfield Youth Soccer League was started, Mark was a charter sponsor and coach. 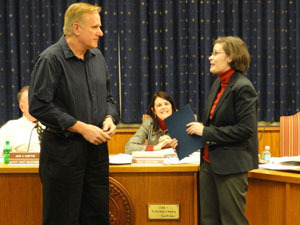 Mark helped spearhead the effort to honor Mr. George Ritchie by having the WYSL name change in George Ritchie’s honor. As the club was formed, Mark became a charter coach, coaching both boys and girls teams. Mark organized with help from Lou Lapenna a winter indoor training program at Charles Wright School and traveled around the state seeking the best indoor soccer competition for the Wethersfield players. During the 1970’s, youth teams from outside the US increasingly started touring our country. Mark seized the opportunity to offer the Wethersfield youth the excitement of international competition. The first International Match was with Konstanz, West Germany with over 1,500 spectators in attendance, the match ending in a 1-1 draw. Over the next 4 to 5 years, Mark organized competition in Wethersfield with touring teams from England, West Germany, Italy, West Berlin, Venezuela, Scotland, and Canada for the players of Wethersfield. In 1979, Mark with the help of Wethersfield soccer families, the WSC began a new chapter, touring outside the US. Wethersfield teams traveled to Belgium, Holland, Canada, Greece, Scotland and Bermuda. As a USSF referee, Mark while on tour was honored by being asked to referee matches in Greece and Bermuda. While touring Bermuda, the Wethersfield players were honored to play the Bermuda Youth National Team. During those International years, Mark held the position as President of the Wethersfield Soccer Club. Reached the level of State Assessor, working to aid referees at all levels within Ct and around the region from 1979 to 2004. Appointed Director in 1995, Mark formed a grass roots program of assessors to travel to youth matches to offer constructive one on one feedback to help improve their performance on the field. In 1997 and 1998 Mark was honored by joining the referee assessment team at the USYSA National Championships being held in Phoenix, Arizona. During the 1998 National Championships, Mark was assigned by USYSA as the referee assessor for the ESPN televised U19 National Championship match. Mark reached the State Referee Grade, working all level matches here and abroad. Refereed matches in Greece, Bermuda, and Belgium and was appointed as a member of the Ct. referee team to work USISL Professional Matches. During the early 1980’s, Mark was select to referee at the Youth National Championships being held in Ct. Expanded in making the CWSL summer tournament a premier event. Worked to rename the tournament in honor of World Cup Referee, FIFA Referee David Socha, “SOCHA CUP.” David Socha was also an active referee in the CSL Div 1 Matches in Ct.
Mark currently resides in West Simsbury with wife Sandi and sons Jason & Ryan. Since moving to West Simsbury, Mark has stayed very active, coaching both in house and CJSA travel teams. Instead of tournaments, Mark has arraigned extended soccer tours to such places as: Philadelphia, Boston, and Montreal, Canada. Besides playing soccer matches, teams would tour historical and educational sites of the area. “Soccer tours will offer players memories that will last for a life time” explained Mark Holowesko. CJSA “HOLOWESKO CUP” – Girls U-19 Spring Cup competition named in honor.